Ezra Levant’s Ethical Oil attempts to underscore the numerous reasons why oil sands oil outshines its global competition to be the most morally and environmentally sound source of global oil. 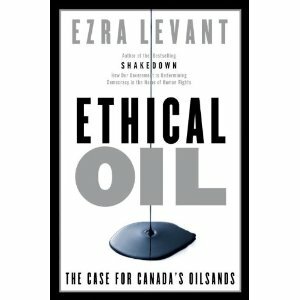 Oddly, Levant doesn’t detail why oil from Alberta is ‘ethical’ per se, so much as he details why oil from OPEC nations are more unethical, contrary to his subtitle. Perhaps. Many do bristle at the thought of continued oil sands development. But rather than explain why tar sands oil is ethical, Levant walks backwards towards his central theme, which is this: oil from nations like Saudi Arabia or Nigeria is so overwhelmingly unethical (in terms of environmental impacts, climate-related shipping, treatment of workers, etc.) that oil from democratic, human rights observing Canada must, ipso facto, be more ethical. Levant maintains that oil production and consumption do not exist in a vacuum: environmental and social contexts are key considerations, and in this he is correct. “Despite the pipe dreams of environmentalists,” he claims, “our carbon-based economy isn’t going away.” One cannot reasonably have a discussion about the ethics of oil sands oil without considering global alternatives. This is a shaky premise upon which to base the argument that the global economy will and cannot limit dependence on fossil fuels — let alone the notion that because Canada has proven oil reserves their extraction is somehow a moral obligation. It’s subjective opinion trumped up as objective truth, skipping a crucial consideration — that any decision made on the presumption that our dependence on fossil fuels cannot be lessened is flawed. Levant believes that most environmentalists argue against oil in favour of a “miracle” fuel that, as yet, does not exist — and that until such a fuel is available, “the question is whether we should use oil from the oil sands or oil from the other places in the world.” His not-so-subtle interspersion of overt nationalism into debate over the environment and our energy future wrongly conflates one with the other: the choice, he posits, is between ethical Canadian oil and a flourishing Canadian economy, or propping up a human-rights abusing theocracy. But even accepting that tar sands oil is more ethical than oil from Saudi Arabia, for example, Levant’s is a misleading and specious argument. Nevertheless, Ethical Oil has changed the discussion of oil production in Canada, and cannot be ignored. This review rightly points out the faulty premise of Tar Sands supporters that there is no alternative to fossil fuels. This also lies at the heart of their argument for the Keystone XL pipeline, i.e., the oil is going somewhere even if it doesn’t go to the U.S. There is just no way that Tar Sands oil will be left in the ground. It seems to me that the oil industry just might be fearful that before very long, people will turn away from fossil fuels as they are forced to face the terrible reality of climate change. Tar Sands oil must be extracted and exported ASAP before the world finally wakes up. What a silly comment. Please, tell us what fuel you are moving to? Please, tell me when we will stop using oil. What will we do when we, ‘wake up’ as you put it. bike everywhere? The oil will be used. You, and every environmentalist in the world will not be able to stop that. There is no other viable alternative. You probably don’t care, however. You are probably one of those folks who thinks that if every human were to die tomorrow, the world would be better off. I suspect that when the average person ‘wakes up’ to what the environmentalist are doing, they won’t be happy. Thanks for your comments. Contrary to your thoughts, I don’t believe the world would be better off without humans, but I do believe we are causing more harm than we should be to the planet that sustains us. I just don’t agree with the notion that there is no other viable alternative – ergo, oil is the only way. I don’t even think we should move away from oil altogether and put our faith in an as yet undetermined fuel source. It’s the defeatist attitude that oil use can’t and won’t diminish, therefore we must use oil. How about just finding ways to use less oil, even? That’s a good start. The problem seems to be that people who argue in favour of continued fossil fuel use at current levels don’t even want to entertain the possibility that even just using less would be beneficial for the earth, and making any sacrifices towards that. And I tire of the old response to this question – throwing it back and saying “please, tell us what fuel you are moving to?” The consequences of our fossil fuel decisions today are too important to be flippant about. This is an important question you pose, but it’s one that everyone should be working towards finding a viable answer to. It should not, as you do, be used as a weapon against those you disagree with. But again – I appreciate the dialogue. This is how things are worked out. I received an email saying that Awreeves replied to my post, but I don’t see the reply here. Either way, I will reply to the points in it. First of all, I should clarify that my above post was pointed at LMA’s post, not the blog post by Awreeves. It was his comment: “the faulty premise of Tar Sands supporters that there is no alternative to fossil fuels” that I meant. His post, and this blog post, makes no mention of any alternative to fossil fuels. That is odd, if ‘refuting the lie’ that oil is needed right now is the goal. I am glad that Awreeves is not one of the group of environmentalist that think that humans are a plague, and need to be eliminated. There are many out there, and they use any means necessary to meet their goal. What is good for humanity is irrelevant to them. Awreeves, you and I agree that humans are doing much more harm than they should. We probably disagree with what is needed to fix this, however. Look at our industry in North America 50 years ago. We are much better, cleaner, and efficient than that now. We will do the same thing, if not more, in the next 50 years. We do not need to sacrifice our economy, or cause people in emerging markets to starve in order to do that. You do say, however, :”I just don’t agree with the notion that there is no other viable alternative – ergo, oil is the only way”, and then don’t propose a valid alternative. You then follow it up with: “I don’t even think we should move away from oil altogether and put our faith in an as yet undetermined fuel source”, so I am a little confused. You then say that we should decrease our usage. I agree, for many reason, and we are, on a per person basis. The problem then becomes population growth. It, and emerging markets, more than covers any decrease we will see in the Developed world. So, unless you know something I don’t know, we are right back at using oil. And until we are not using oil, I would support people buying Canadian oil, rather than any other type. Tell me, Awreeves, seeing as how you admit that we will be using oil for quite some time, do you support people buying it from Canada, or from some other country? That is the whole point. Ezra doesn’t need to defend oil, we will use it. He also doesn’t need to highlight how ethical Canada is, that is a given. He only needs to make the case that if people are going to buy oil, they should, for ethical reasons, buy it from Canada. My personal belief is that the ‘fight’ to stop the oil sands from producing oil is not for any other reason than an attempt to force people to change their habits. If the oil sands stop producing, it will make oil so expensive that people will start to use other sources of energy (that currently don’t exist), or reduce usage. Then they can go after the other producers, and try to shut them down. It is faulty logic, and it won’t work. They are welcome to try, however, and if successful, they will only damage the world economy, cause people to starve, and then we will end up right back there digging. I am a realist, and this seems pretty obvious to me. Debate is good and healthy, but facts trump feelings and good intentions.